How I do love a great child’s art print. Preferably something that’s not too cutesy, maybe even a little funky, full of colour and not too traditional. Not much of a tall order right? Well apparently not since the fabulous Suzy Ultman is answering the call! The saying of “everything old is new again” rings true when I cast my eyes upon Suzy’s work. Her illustrations are reminiscent of something I’d expect see originating from the Sixties or Seventies, it has a vintage vibe yet still remains modern in the here and now. Each print is a limited edition of an original Suzy Ultman illustration, printed on archival quality paper using gorgeously rich coloured ChromaLife inks. 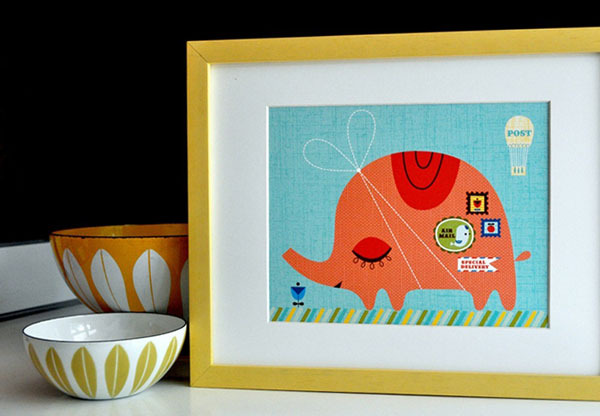 I love the Special Delivery print, this is one elephant that any parent will love in their child’s nursery. 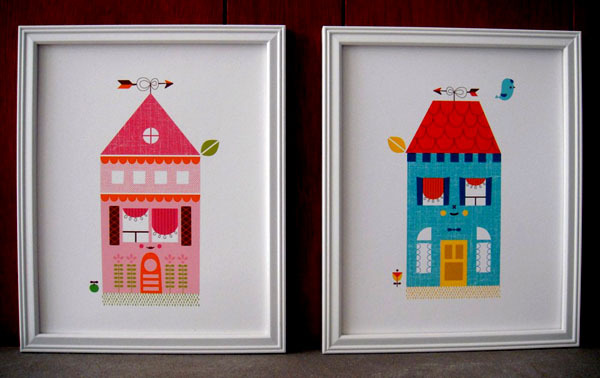 My crazy-about-all-craft eight-year-old daughter loves the Craftland print and it would look perfect above her desk, while I think the Mr House and Ms House prints (pictured below) are perfect for creating symmetry in a shared room. See all the prints available with prices starting from US$20 at the Suzy Ultman Etsy store.